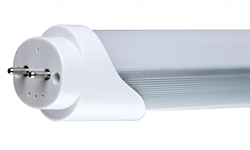 LED Lighting Inc. expands T8-series with new G3 ballast-compatible T8 tube lamp with a 90+ CRI. This solution is beneficial for individuals that want to replace existing lamps without having to rewire or remove the current ballast. LED Lighting Inc. (http://www.ledlightinginc.com), a primary resource for custom illumination solutions, has expanded their T8-series product line to include an LED ballast-compatible Generation 3 (G3) 90+ CRI (Color Rendering Index) T8 tube lamp. The ballast-compatible tube lamp features plug-in-play technology, in which the LED lamp plugs directly into most existing fixtures (compatible-ballast with LLI-T8BC list). In addition to the ballast-compatible component, customers will also experience energy-saving benefits including a long lifespan of an estimated 50,000 hours and may also qualify for energy-efficient rebates. “This solution is beneficial for individuals that want to replace existing lamps without having to rewire or remove the current ballast,” said Chief Operating Officer Kristin Burt. The 18-watt, 4-ft LED tube lamp is available in neutral white (4000K) and cool white (5000K); all UL certified, DLC approved and meets CA Title 21 requirements. LED Lighting Inc. can customize the ballast-compatible G3 tube to meet customer specifications, offering multiple options including, internal/external driver, one end input/two end input, dimmable/non-dimmable and a clear or frosted lens. The ballast-compatible tube is recommended for the following applications: airports, auto dealerships, corporate campuses, educational facilities, government facilities, healthcare facilities, industrial and warehouse lighting, recreation lighting, restaurant and hotel venues, retail and any other application that requires LED T8 replacement lamps. A 90+ CRI allows customers to distinguish slight shades of color in color-critical applications. The CRI measures the light source’s ability to show object color naturally compared to a familiar reference source, either incandescent or daylight. The advanced design will compliment retail stores, art galleries, museums, high-end homes, architecture, photography, cinematography or any application where extreme color accuracy is required. LED Lighting Inc. continues to relentlessly expand and position itself as one of the only Custom Illumination Solution specialists in the marketplace, since 2004. As an innovator of LED lighting and technology, LED Lighting Inc. recognizes its uniqueness with providing custom applications and meeting detailed specifications. LED Lighting Inc. products are thoroughly tested and backed with strong warranties. For more information visit http://www.ledlightinginc.com.